This afternoon, Paul Baumann appeared at my desk bearing a quizzical look--and a gift. 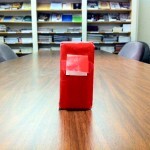 "This has been sitting in my office for a week or so. 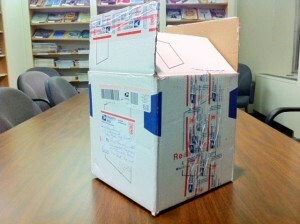 I don't know the name on the return address." I didn't recognize it either. Paul handed me a small box wrapped in red paper--tagged "Grant G." There was one for Paul, one for me, and one for Patrick Jordan. They came in that box. "Maybe we should make the intern open these," I suggested. But he'd left for the day. Paul shook his box. I shook mine. No ticking. "I can't not open this." I tore open the paper. A yellow box was inside. A small envelope taped to the back. It bore a Latinate seal. Inside was what looked like a holy card for Pope Pius IX on which was printed several helpful facts: "Longest reigning pontiff since St. Peter" and "Defined the dogma of papal infallibility." And at the bottom of the card: "Scratch 'n' sniff to experience Pio Nono's personal, private cologne." 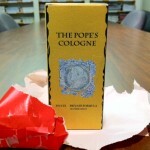 On the front of the box: "The Pope's Cologne." Paul already had his open. "It smells awful." And it does. 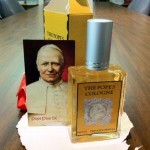 A sticker on the back of the bottle explains: "The Popes Cologne is a classic Old World cologne made from the private formula of Pope Pius IX (1792-1878). We obtained this formula from descendants of the commander of his Papal Guard and faithful friend, General Charles Charette. We have followed this complex, exclusive formula meticulously, using the same essential oils that his perfumers used 150 years ago. We believe that we have succeeded in capturing the same fragrance that he and those around him enjoyed so long ago. This is a truly extraordinary cologne with surprising freshness and notes of violet and citrus. We are pleased that you will have the opportunity to enjoy this wonderful, historic fragrance. It is an honor for us to be able to produce it and make it available for your pleasure today." If my nostrils hadn't been burned out by this stuff, I'd be able to tell you whether that description is accurate. I can only report that after inhaling this historic scent, I've never felt better about my suspicion of papal infallibility. At a newsstand near you. Again.